JANUARY 30, 2019 (Scarborough, ME) – Southern Maine Agency on Aging (SMAA) is proud to announce that it has received the SAGECare Bronze accreditation. SAGECare provides training and consulting on LGBT aging issues to service providers. 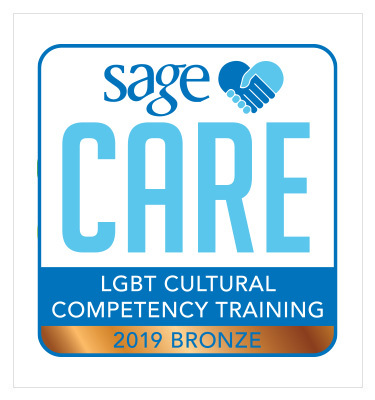 Upon completing the Bronze level training, SMAA staff is better equipped to handle the needs, concerns and unique history of LGBT older adults, as well as how to take meaningful steps to immediately improve the qualify of support and services we provide. SMAA participates in this training annually and is now certified through the end of 2019. Since 1973, the Southern Maine Agency on Aging has provided residents of York and Cumberland counties with resources and assistance to address the issues and concerns of aging. The Agency serves people ages 60 and older, family caregivers, and people under 60 with a disability. Agency services are devoted to fulfilling its mission to improve the quality of life for older adults, adults with disabilities, and the people who care for them. For more information, visit www.smaaa.org.